Designed for the unattended monitoring of noise in poor weather conditions, this hire kit consists of a Class 1 Optimus Green sound level meter in a protective case with an outdoor microphone. 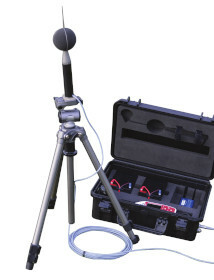 This Outdoor Noise Measurement Kit contains a Class 1 Data Logging Sound Level Meter (the CR171B Optimus Green), fitted with real-time Octave and 1/3 Octave Band Filters. It includes the usual environmental noise measurement parameters, such as periodic LAeq, LAMax and statistical Ln values. Timers make it easy to carry out automatically repeating measurements, as required by most environmental noise standards. The WPK171B, with its top specification sound level meter, is intended for all short term environmental noise monitoring applications. The CR171B Optimus Green Sound Level Meter can be easily removed from the case. We provide it with a preamplifier that plugs into the top to enable it to be used as a stand alone hand-held meter. 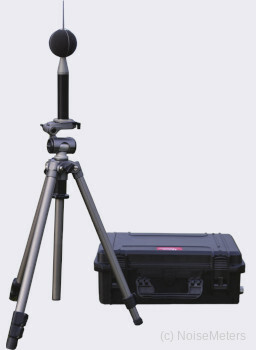 The noise measurements can be viewed on the meter's display but it is usually more convenient to download them to a computer. You can use the NoiseTools software that is included in the kit to download all the noise measurements and produce reports.